Although no one ended up clutching a trophy Sunday, smiles still came pretty easy for the trio of drivers sponsored by racing legend Tommy Thompson and his Magic Dry Organic Absorbent product. Top Fuel Harley rider Rickey House and Top Alcohol Dragster pilot Shane Conway both reached the semifinals, while Top Fuel favorite Scott Palmer found a little of last year’s mojo by winning his first elimination round of the season. In Top Fuel Harley, House knew he had an immediate chance to move up in the rankings if he beat first-round foe Tii Tharpe, who started the weekend just nine points ahead of House. A 6.364 at 218.48 mph did the job as Tharpe got out of shape and coasted to a 15.059 at 42.50 mph. 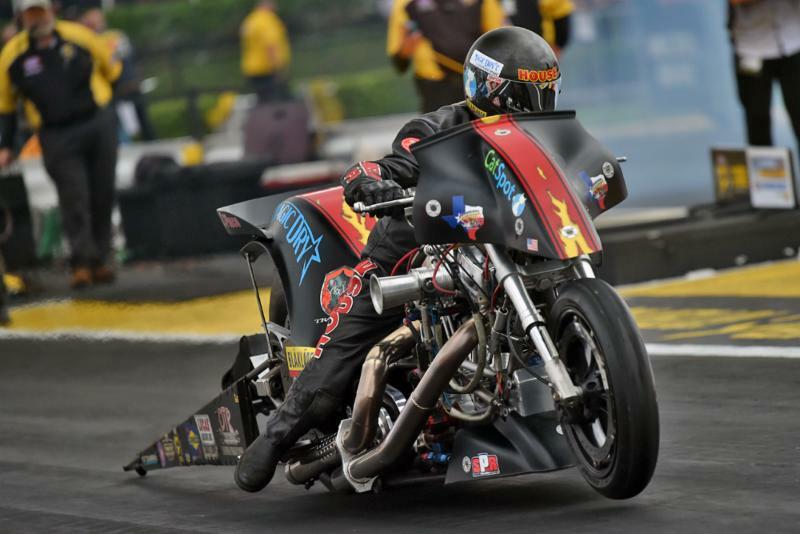 That put House in the semifinals where his bike spun the rear tire early in the run, handing Scott a ticket to the final with a 6.364 at 213.27 mpg to House’s surrendering 8.445 at 129.55 mph.